The lightning-fast iPhone 5S is here -- and so is its lower-cost, colorful, plastic cousin called the iPhone 5C. Apple (AAPL) CEO Tim Cook unveiled the two new iPhones on Tuesday at an event at the company's Cupertino, Calif., headquarters. The new flagship iPhone 5S is similar in appearance to last year's iPhone 5, but it's twice as fast thanks to Apple's new A7 chip. Other hardware upgrades include a beefed-up camera with a dual-LED flash to improve color balance, and a new M7 "co-processor" that measures motion data -- a valuable feature for health and fitness apps. New features of the iPhone 5S include slow-motion video and a camera "burst mode" that shoots 10 frames per second. And the most futuristic iPhone 5S rumor proved to be true: The new iPhone includes a "Touch ID" fingerprint sensor built into the home button. Users can simply touch to unlock the phone, and they can scan their fingerprints instead of entering passwords for apps like iTunes. It's a "key that you have everywhere you go," Cook said. The new device will be available in silver, gray and gold. The iPhone 5S will go on sale Sept. 20 in nine countries, including the United States and China. The 16-gigabyte version costs $199 with a new two-year contract, or $649 contract-free. The 32 GB and 64 GB versions will cost $299 and $399 with a new contract, respectively. Apple will begin taking pre-orders on Sept. 13. Shares of Apple were down by 2% after the presentation. iPhone 5C: The flagship device wasn't the only iPhone Apple revealed. Cook also debuted a lower-end, cheaper plastic device called the iPhone 5C. The device is available in white, green, blue, pink and yellow. "The iPhone 5C is beautifully, unapologetically plastic," Apple chief designer Jony Ive said in a video Apple played at the event. 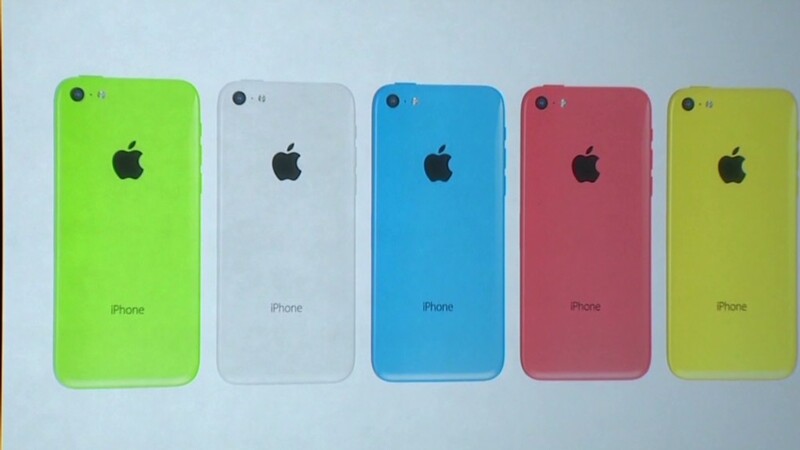 The 5C features a polycarbonate shell, instead of the glass-and-aluminum body of the current iPhone 5S. Its guts include Apple's A6 chip and an 8-megapixel camera, like the iPhone 5. The iPhone 5C costs $99 for a 16 GB device on a two-year contract, or $199 for 32 GB. Its pre-order and ship dates are the same as the iPhone 5S. The two-year-old iPhone 4S will be free. Many assumed the iPhone 5C would be aimed at helping Apple expand its reach in new markets like China, where wireless carriers don't typically subsidize phones. But at $549 without a contract, the 5C can hardly be called cheap. China will be in focus again on Wednesday, as Apple is holding a second launch event in Beijing. IOS7: The new iPhones will feature the new iOS 7 operating system that the company previewed in June. IOS 7 will roll out on most older versions of the iPhone on Sept. 18. The new iOS 7 is a major design overhaul that includes a pastel color palette, much-improved multitasking ability, a better Siri voice assistant and an upgraded notifications system. The operating system also includes the new iTunes Radio, a competitor to services like Pandora (P). Apple will ship its 700 millionth iOS device by the end of September, Cook said. Free iWork apps: Apple also said Tuesday that its five iWork productivity apps, including iPhoto and iMovie, will be free on new iOS devices. 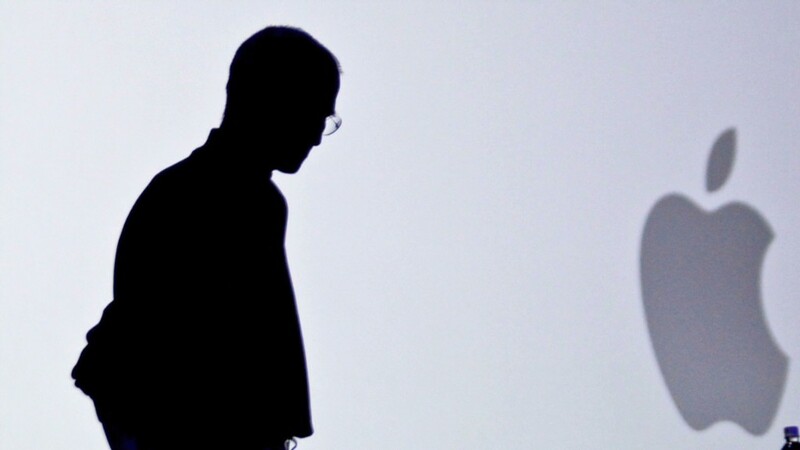 Plenty of other products churning in the Apple rumor mill weren't mentioned on Tuesday. Apple will probably hold a separate event in October to focus on an updated iPad and iPad Mini, as well as a revamped Apple TV. Other products supposedly in the works, including a smartwatch and an "iTV," aren't expected to be revealed anytime soon.